A no-deal Brexit would deprive some developing countries of tariff-free access to the UK market. Under the worst-case scenario, developing countries could suffer a $1.6 billion or 5 percent decline in their UK exports, with least developed countries among the worst affected. To minimise the damage, the UK government must prioritise legislation that would maintain preferential market access for developing countries. The most immediate and direct impact of a no-deal Brexit on developing countries would be the loss of trade preferences that allow their exports to enter the UK with low or no customs duties. Currently, all low- and lower-middle-income countries benefit from preferential access to British markets, either under the EU’s Generalised Scheme of Preferences (GSP) or under an EU Free Trade Agreement (FTA). In the event of no-deal, these arrangements would cease to apply in the UK. While the government intends to “replicate” trade preferences “as soon as possible,” it seems highly unlikely that it will finalize any bilateral FTAs by the 29 March deadline. Therefore, any no-deal outcome will involve some reduction in market access for developing countries—the extent depends on which of two possible scenarios occurs. The best-case scenario is that the UK replicates the EU’s GSP before Brexit. Beneficiaries of the EU scheme would maintain their existing trade preferences. Only developing countries with FTAs would incur tariff increases on some British exports, since they would transition to the relatively less generous GSP arrangement. Still, they would benefit from preferential market access relative to advanced countries, which would face the UK’s highest applied tariffs, so-called Most Favoured Nation (MFN) rates. [i] Fortunately, this best-case scenario is also the most likely. The government already has the power to introduce a trade preference scheme under the Taxation (Cross-border Trade) Act 2018. It need only pass secondary legislation to implement a replica GSP, legislation that (we are told) is ready to go. Still, given the unprecedented levels of political uncertainty, there’s a risk that Parliament will not approve a UK preference scheme by end of March. To enter into force, the secondary legislation must first be laid before the House of Commons for 21 days under the negative procedure. If, for example, MPs vote to hold a general election, or Brexit congests the parliamentary business schedule severely, then this procedure may not complete in time. Under this worst-case scenario, following no-deal, developing countries would lose all preferential access to the UK and face much higher MFN tariff rates. Higher tariffs would increase the landed price of developing countries’ UK exports, lowering demand for these products in UK markets—an impact known as the trade destruction effect. Higher tariffs could also have a trade diversion effect, whereby the increase in the relative price of developing countries’ exports would cause British consumers to substitute them for cheaper alternatives. This would occur if the rates applied to developing countries’ UK trade rose by more than those applied to advanced countries’ trade. I focus here on the trade destruction effect of a no-deal Brexit on developing countries, calculated for the best- and worst-case scenarios to quantify and compare the impact of each on developing countries’ UK exports. While trade destruction is clearly only part of the story, it nevertheless captures which country exports would suffer the greatest direct decrease in UK demand due to the imposition of higher tariffs following no-deal. For a given country-export, the trade destruction effect is calculated as the product of (1) the extra duty it incurs following no-deal and (2) its UK import demand elasticity. [ii] The effects are calculated at the six-digit level of the Harmonised System (HS) 2012 and summed to generate an overall country estimate. Developing countries’ UK trade is eligible for six types of preferential arrangement, of which three are unilateral schemes under the EU’s GSP and three are reciprocal EU FTAs. The schemes under the GSP include a Standard GSP scheme for lower-middle-income countries (LMICs), an enhanced GSP+ scheme for LMICs that meet certain vulnerability criteria, and an Everything But Arms (EBA) scheme for UN-designated “least developed countries,” which include all low-income countries (LICs) and some LMICs. The types of FTAs that the EU has agreed with developing countries include Association Agreements (AA), Deep and Comprehensive Free Trade Areas (DCFTA), and Economic Partnership Agreements (EPA). For each of these preferential arrangements, Table 1 presents the number of beneficiary developing countries, the value of their UK exports, the average trade-weighted UK tariff rate, and the total duty levied annually. [iii] Overall, developing countries export $30.9 billion to the UK per year. This trade incurs an average tariff of 1.8 percent, generating $558 million in customs duties annually. Source: Author’s elaboration based on UN COMTRADE and UNTAD TRAINS. Table 2 presents the extra duties developing countries’ UK exports would incur following no-deal and the impact on demand. The trade destruction effect under the worst-case scenario is almost eight times greater than under the best-case scenario. If the UK replicates the GSP before leaving the EU, LMICs that currently benefit from FTAs would pay $181 million in additional duties after transitioning to the Standard GSP scheme. (Low-income economies benefitting from FTAs would transition to the EBA scheme and continue to receive duty-free access). This would result in a reduction in UK demand for their exports of $203 million or 0.7 percent. But if the government fails to maintain any preferential access for developing countries, then UK demand for their trade would fall by $1.6 billion or 5.1 percent. The worst-affected countries would also be the poorest. 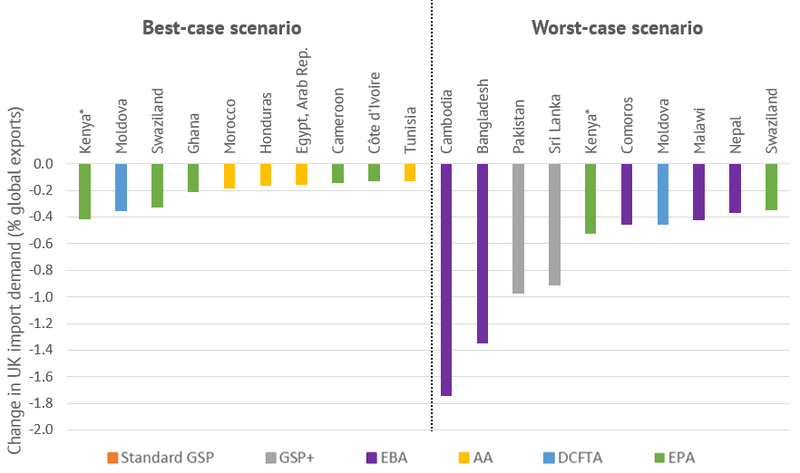 Least developed countries trading under the EBA scheme would face the highest trade-weighted UK MFN tariffs of 10.6 percent, resulting in a $635 million decline in UK demand for their products. Source: Author’s elaboration based on UN COMTRADE, UNCTAD’s TRAINS, and Kee et al. (2009). The trade diversion effect would likely reinforce these results. Under the best-case scenario, developing countries would mostly benefit from a positive trade diversion effect, since advanced countries would all incur much higher (MFN) tariffs. In contrast, under the worst-case scenario, developing countries would suffer a negative trade diversion effect due to the elimination of their relative price advantage. Under the worst-case outcome, Bangladesh, Cambodia, Pakistan, and Sri Lanka emerge as the biggest losers. Because the UK remains a major trading partner for these big economies, accounting for around one-tenth of their global exports, the elimination of UK preferences would drive large absolute and proportional declines in their trade. Moreover, these trade destruction effects would be concentrated in a handful of key UK exporting sectors that would face large tariff increases under MFN terms. For example, in Cambodia, 20 percent of the absolute decline in UK exports would occur in the bicycle manufacturing sector, where UK tariffs would increase from 0 percent to 15 percent, with the rest occurring in apparel and footwear. Textiles and clothing is also a large part of the story for the other three countries. In Bangladesh, cotton jackets and t-shirt exports alone would account for one-third of trade destruction. Therefore, countries’ percentage decline in global exports may be much worse at the sector-level than the country-level. *Kenya has been granted duty- and quota-free access to the UK under Regulation (EU) 2016/1076. It is therefore counted as an EPA-beneficiary country for the purposes of this analysis. The UK government has pledged to improve access to the UK’s markets for the poorest countries after Brexit. As well as causing significant damage to the UK economy, even the best-case no-deal scenario would break that commitment. Minimising the damage will require passing legislation to replicate the EU’s GSP in the UK before 29 March. This would be by far the least destructive no-deal outcome for developing countries’ trade, particularly for the poorest countries. It would also help ensure that trade isn’t diverted away from developing countries’ in favour of more advanced economies. Once unilateral preferences are in place, the UK should prioritise extending those preferences in terms of products and countries. My colleague Ian Mitchell has argued that this would be good for the UK and good for development. I am grateful to Matt Grady, Sam Lowe, Liz May, Maximiliano Mendez-Parra, and Ian Mitchell for their advice and comments. [i] This analysis assumes that the UK’s MFN tariffs would be set at EU MFN rates. This is the modelling assumption employed by the UK government’s own economic analysis of a no-deal Brexit, however, the UK would be free to set its own MFN tariff schedule after Brexit. [ii] UK import demand elasticities are estimated by Kee et al. (2009) at the HS 1988 six-digit level. Here, they have been converted to HS 2012 product codes and outlier estimates have been replaced with elasticities that would generate a reduction in UK demand of at most 100 percent. [iii] The Democratic People's Republic of Korea, Kosovo, Timor-Leste, and the West Bank and Gaza are excluded due to a lack of UK export data. Kenya has been granted duty and quota free access to the UK under Regulation (EU) 2016/1076 due to its status as an African, Caribbean and Pacific country that is not eligible for EBA but has concluded an EPA awaiting ratification. It is therefore counted as an EPA-beneficiary country for the purposes of this analysis.